When I think of Laura Ashley I think of stylish, slightly vintage home ware. What I don't think is perfume and I'm probably right to assume you would agree. However push aside that assumption because Laura Ashley launched 3 exquisite Eau De Parfums late last year. 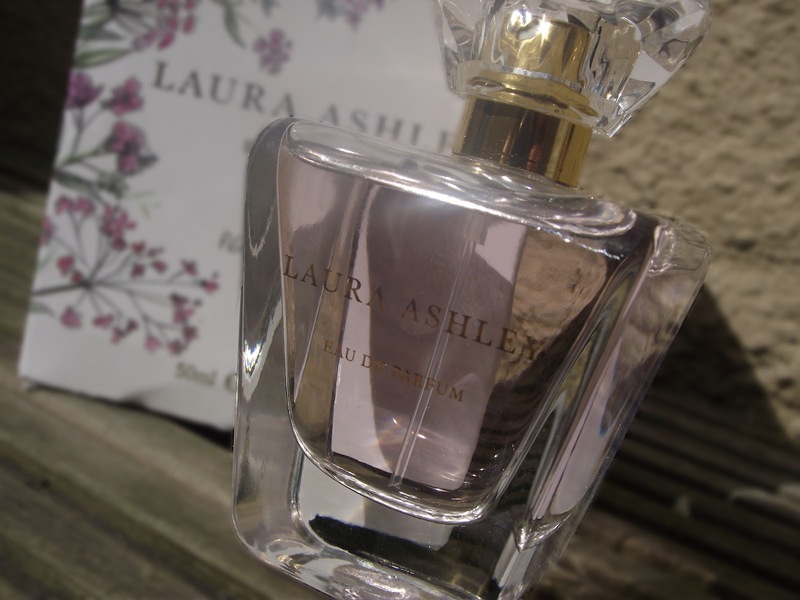 Each fragrance uses the finest of ingredients which reflects the elegant luxurious lifestyle of Laura Ashley. Today I want to share with you my thoughts on 'Pink Petals'. I want to give a special mention to the packaging, when you purchase a perfume I think the packaging and how the perfume presents itself is important. I love the delicate spray of flowers which adorn the box. When you open up the box, the inside is filled with lots of tiny pretty butterflies. It really gives a sense of a fresh spring/summer day. The bottle is elegant and very feminine, with a nice chunky crystal top. The actual colour of the perfume lives up to it's name Pink Petals, you can see from the photos it's a very soft pink shade which looks so pretty. Pink Petals is a fresh floral scent which is perfect for the day time, I've been reaching for this and can't get enough of it. 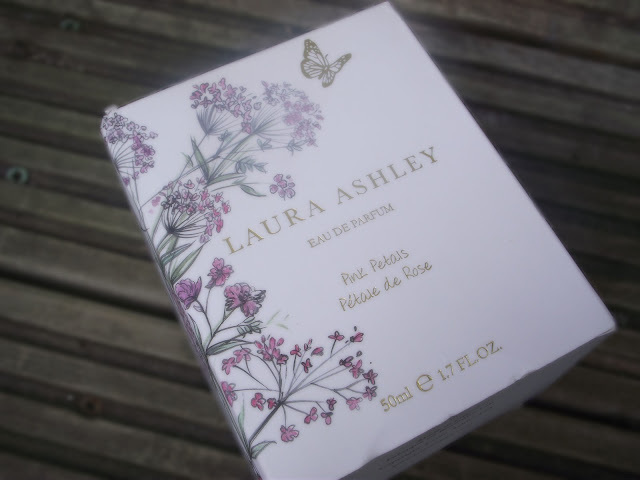 When I read the fragrance notes I wasn't surprised why I fell in love with Pink Petals. A fresh floral composition which opens with light exotic Water Fruits that are entwined with a sultry pink heart of Rose absolute, Frangipani and Muget that rest on a creamy woody base of Musk crystals, Sandalwood and Rich Olibanum. There's actually another two perfumes available, so depending on what scents you like you may like one or all of them! I love the sound of Floral Heart, with notes such as Tuberose absolute I imagine this to be another fine perfume. 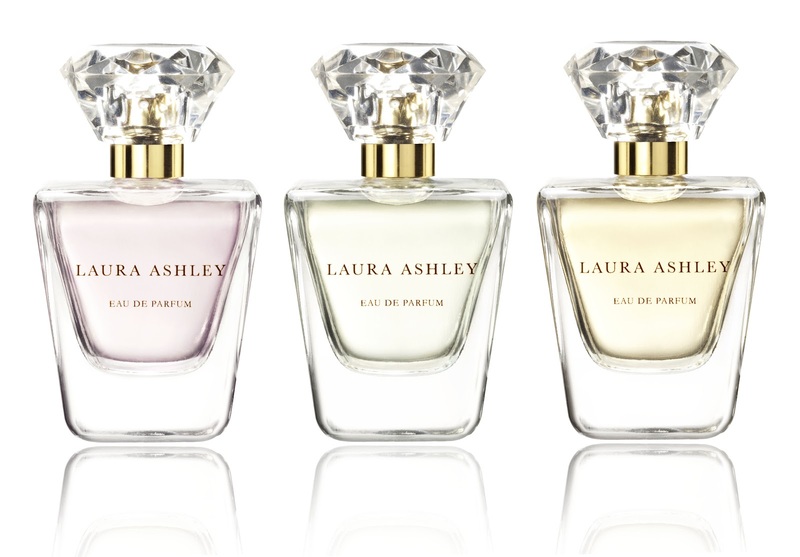 Have you seen these perfumes from Laura Ashley? If not I recommend you take a spray when You're next near by!